LAST NIGHT saw the world premiere of the film, ‘Blinded by the light’, at the Sundance Film Festival 2019. Directed by Gurinder Chadha and adapted from Sarfraz Manzoor’s best-selling memoir, ‘Letters from Bury Park’, the film chronicles the growing pains of ‘Javid Khan’ who lives in Luton, dreams of escaping and being a writer in London. He faces many obstacles, not least his Pakistani father who says it is ok if he becomes a lawyer, rather than a doctor as he is more understanding than others. Amidst the growing alienation between father and son, Khan is introduced to the music of Bruce Springsteen and falls in love with ‘The Boss’ music, and uses his lyrics to give him solace and inspiration as he becomes a man. With a soundtrack complete with Springsteen songs and a score by AR Rahman, this film has a very rich offering and was the subject of a standing ovation and prolonged applause in Sundance. In the video, we interview Chadha, Manzoor, who developed his own book, alongside Chadha and Paul Mayeda Berges (screenwriting partner) into a film script; and new star Viveik Kalra. There are also excerpts from the post screening Q&A session at the Eccles Centre in Park City, Utah. Apologies for the quality of this compared to our usual output, this was shot on a phone by www.asianculturevulture.com editor Sailesh Ram. 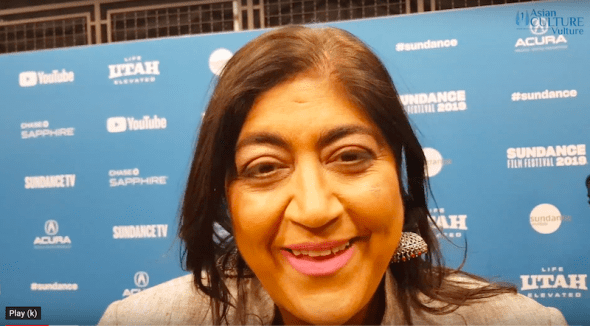 For more from the festival from acv, across Sundance, including an interview with Mindy Kaling, please see other social media and use search tag, #sundanceacv19 – thanks!